This is the fifth book in the Webb’s Glass Shop Mystery series and “star,” Savannah Webb, takes this time to switch gears and bring her skills and talents out on the water. There are a couple of reasons why Savannah, glass shop owner, decides to accept the offer to perform on a Mediterranean cruise that will give her the chance to show the passengers her expertise in the field of glass blowing. Not only will she get her name out and perhaps bring more advertising to her own shop, but she’ll also be able to use the time to catch up with her boyfriend’s family. Edward is the man she loves and his cousin, Ian, will be hopping aboard to share time with both of them. The immediate future looks sunny, but even Savannah can’t be surprised when darkness eventually finds her at sea. Ian vanishes at the very beginning of the cruise, which frightens and confuses both she and Edward. When it comes to the law aboard ship, they believe at first that Ian has taken his own life, but as the story progresses and viewpoints change, Edward becomes the prime suspect in what is now believed to be a case of murder. Savannah not only is concentrating on her work for the cruise, but she is also having issues with other glass artists who are there to show their skills. But nothing can stop her from saving Edward’s life, proving what really happened to Ian and bringing the villain to light. These books are great mysteries that keep the reader involved, but the added extra of being able to learn more about the fine art of glassblowing makes it all the more interesting. 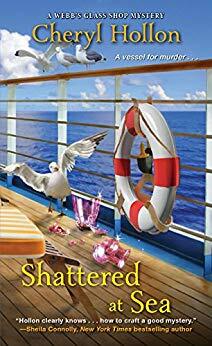 Be the first to comment on "“Shattered At Sea” by Cheryl Hollon"